Shaheed Bhai Inderjeet Singh Jammu was born on the 26th of January 1967 into the house of Bhai Gurcharan Singh Fauji and Bibi Amarjeet Kaur. Bhai Sahib’s family hailed from the village Batot, Guhar in the hill areas of Jammu & Kashmir. Bhai Sahib was the eldest of 6 brothers and sisters. 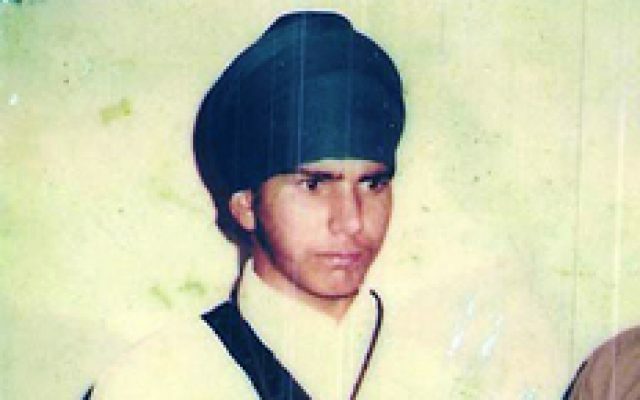 Bhai Inderjeet Singh became attached to Gurbani at a very young age and at the tender age of 10 was often on the Gurdwara Sahib stages reciting poems of Jujharoo Singh’s and talking of Panthic issues. Bhai Sahib studied till 10th class at Government Secondary school before taking admission in ITI Electronics. Whilst completing his studies Bhai Sahib became very active in Gurmat Smagams. Bhai Sahib heard news of the unsettling situation of Panjab and decided to go to Amritsar. Upon reaching Amritsar Bhai Sahib met Singhs from Ajnala who took him to the residence of Sant Dyal Singh Lachmansar, however Bhai Sahib felt uncomfortable here and one day left to have a glimpse of Sri Darbar Sahib. Bhai Sahib had desired to meet Sant Jarnail Singh Ji Khalsa Bhindranwale as he had heard from many people that Sant Ji was a majestic saint. Upon meeting with Sant Jarnail Singh, Bhai Sahib expressed his wish to stay with Sant Jarnail Singh and the Jatha; Sant Jarnail Singh obliged and introduced Bhai Sahib to the rest of the Singhs. Sant Dyal Singh tried to stop Bhai Inderjeet Singh, but Bhai Sahib nevertheless went on to join Sant Ji and the Jatha. Bhai Sahib’s family yearned to meet him, but he told them that he was now only dedicated to his service for the Kaum. A few days prior to the Indian Army attack on Sri Darbar Sahib, Bhai Sahib wrote a final letter to his parents, in which he mentioned the Army taking up positions around Sri Darbar Sahib. During the Indian Army’s attack on Sri Darbar Sahib, Bhai Inderjeet Singh was positioned at the water tanks by General Shabeg Singh Ji. From this position Bhai Sahib eliminated any officers advancing towards Darbar Sahib in a quick hail of bullets. Bhai Sahib used the advantages of being on the water tank very wisely; from here he had gained a height advantage and could locate the positions of the Indian Army and began eliminating those within firing range. Bhai Sahib fulfilled the duty assigned to him to the highest extent and caused major casualties within the Indian Army ranks thus stopping them from making any progress. On the 3rd of June 1984, Bhai Sahib’s duty was changed; he was now assigned to the top floor of the Sham Singh Dera Building. This building is located on the Amritsar flour market side. From this positioning Bhai Sahib had a clear view of the Indian Army’s positions and was able to fire at them with ease. The brave warrior once again fulfilled the duty assigned to him by General Shabeg Singh Ji and continued causing heavy casualties and chaos amongst the Indian Army ranks. On the morning of the 7th June, at 11am the Indian Army focused its attention on the Sham Singh Dera Building, the position was attacked with heavy force in which many Singh’s attained Shaheedi. The remaining Singh’s, including Bhai Inderjeet Singh, were now out of ammunition, they had no food supplies and had been hungry for days they had become very weak due to this. The Indian Army entered the building and arrested these Singh’s. These Singh’s were not spared by the brutal Indian Army Forces. Bhai Inderjeet Singh along with 21 other Singh’s were simultaneously fired upon, thus attaining Shaheedi. The news of Bhai Sahib’s Shaheedi reached his family via Baba Dyal Singh. The brave warrior son of Sri Guru Gobind Singh Ji (aged only 17 years and 5 months) did not only leave his name in the history books but left the world with the title all warriors pray for: Martyrdom. Oh My Beloved True Lord I paid my debt of dasvand (10%) in the form of my son. Bhai Sahib’s family today still remember and keep the loving spirit of there brave son alive. Who is Harnek Singh ‘Neki’ New Zealand? Life Sentence Handed to 3 Sikh Youth for Possession of Literature.